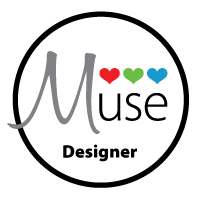 I am the Muse this week for challenge #203. 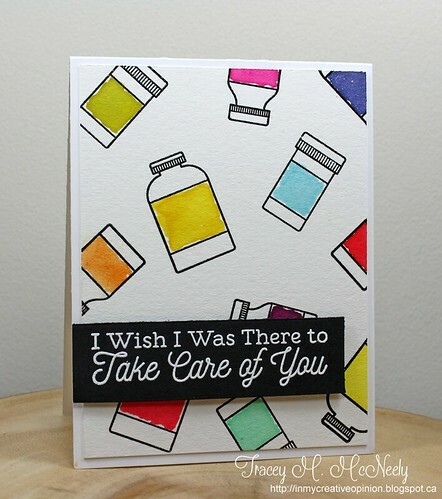 I played with a new to me set from MFT Stamps called Feel Better. This sentiment seemed like the perfect one to use on a card to send to my mom. 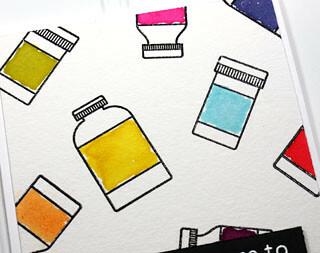 I Stamped and heat embossed a bunch of medicine bottles so that I could watercolour them. I inked up first with VersaMark and then with VersaFine Onyx Black before clear embossing on watercolour paper. I did some loose watercolouring, channeling with inner Maria Peters, using an assortment of Distress Inks. I was so fun to play with these bold colours. I hope to see you come and play along with us this week at Muse! I love this card and I cannot wait to play along. It reminds me of why I HAD to have this stamp set! This is so cute Tracey! Love that fun and colorful background sure to make someone feel better! this is so cute, Tracey - i have had that set on my wishlist for a few months - think i really need it now that i've seen your card! I just ordered this set and am so glad to see how you used it, Tracey. I love all over stamping. great design, I love the pops of color! Fabulous card for the Muse club, Tracey. Thanks for the inspiration this week, it was fun to join in.